Many cat owners believe their feline friends are nocturnal creatures — they’re most active at night. Certainly, their cats’ behaviors — sleeping all day and and playing rambunctiously overnight — seem to confirm that belief. But are cats really nocturnal? Despite your cat’s total disregard for your sleep schedule, your kitty isn’t actually nocturnal. Pet cats (Felis silvestris catus) are actually crepuscular, meaning they are most active at dawn and dusk. However, a particular cat’s behavior may also depend on your lifestyle. The word crepuscular is derived from the Latin word crepusculum, which means twilight. (Nope, nothing gross or creaky is involved!) These animals — including pet cats, rabbits, certain deer, mice, bats and opossums — evolved to take advantage of cooler desert temperatures, receding daylight and darkness, and prey availability. In fact, according to BBC Earth News, a commonly quoted theory for twilight activity is that it offers an optimal balance between light and dark: there’s enough light to see prey, but it’s dark enough to lower the odds of being prey. It makes sense that cats would behave that way, considering they’re descendants of the African wildcat (Felis lybica) and can be both predator and prey. Still, it can be easy to mistake your supposedly crepuscular kitty for being nocturnal — especially if your cat routinely has the “zoomies” night after night. And let’s not forget to mention your kitty’s demands for at least one overnight snack, often between 3 a.m. and 4 a.m. — a popular feline happy hour! True nocturnal animals, such as raccoons and many owls, are most active at night and sleep during the daytime. Your cat’s activity level may vary with your — and their — lifestyle and may not be completely hardwired by genetics. 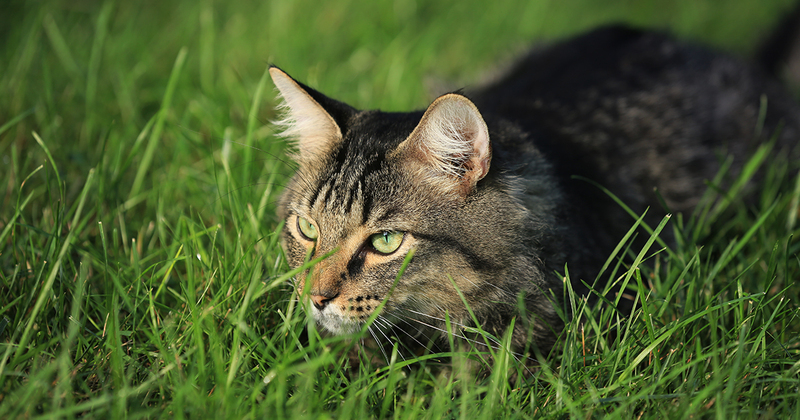 Researchers at the University of Messina in Italy studied the effects of housing and human presence on cat activity. Ten healthy adult pet cats were divided into two groups living with their owner in their home. Cats of group A lived in a relatively small house with access to a small garden between 8 a.m. and 9 a.m. Group B cats lived in a large house with a large garden to which they had free access all day. From 9 p.m. to 8 a.m., group B kitties stayed outside. Owners of all 10 cats followed the same daily routine. All cats were fed dry food at 8 a.m. At 9 p.m., group A cats were fed wet food, while group B cats received dry food. All cats had free access to water. To measure the cats’ activity levels, each one wore a special recording device on their collar for 10 days. The researchers then calculated how active each cat was overall, and how active each one was at night versus during the day. The results showed that group A cats were most active during daylight hours and when their owners were at home interacting with them. Group B cats, however, were most active overnight and, unlike group A cats, had a daily rhythm to their activity levels. These findings led researchers to conclude that pet owner presence and care can influence cat activity and that cats adapt their lifestyle to their owners.